Probably about 10 years ago, we were driving in Boylston, MA (near Wachusett Reservoir) and a huge moose crossed right in front of us. Thank goodness we were able to stop in time. That thing would have crushed our Ford Focus. It was such a thrill to see it, it was surreal and unforgetable. When I was Director of Wachusett Meadows in the late 60’s – early 70’s I found moose tracks twice in a small “boggy” area on the back side of Brown Hill. By the time someone came out from Lincoln to verify it they were gone. Ah well. According to the Director of Land & Forest Conservation for the MA Executive Office of Energy & Environment, at 62 percent forest cover, Massachusetts is in fact the 8th most forested state in the country. The Northeast and Northwest US have an abundance of forest cover, compared to the rest of the country, giving us an extra responsibility to conserve/enhance it as part of a global climate change strategy (trees absorb as much as 15 percent of greenhouse gas emissions). October Mt State Park has a number of them, according to what the people in the office (accessed from Lenox Dale) told us. Looking for them during the rut is not recommended–one of them even attacked the state park official’s pickup truck a couple of years ago, being over-excited. A friend and I were shocked to find an injured moose in Leicester, MA a few years ago…a road hit. She immediately called the man in charge of Animal Control in Leicester and said he was ‘the best thing going for animals’. It was so sad. My hubby and I witnessed a ‘cow’ with her ‘calf’ (is this correct?) while on a Maine Whitewater rafting trip. We also came very close to one in New Hampshire while hiking with the AMC. . .it was only several yards away. But our favorite experience happened while visiting a friend who moved to Alaska in 1988. There were moose just about everywhere. We pulled up to one in our vehicle. It was right on the side of the road munching away…we could have reached out and touched it! We have seen them in New Hampshire (and unfortunately we chanced upon an injured moose in Leicester, MA on the side of the road). No one had stopped after hitting this poor animal, but my fast thinking friend called a well-known animal control person. In Anchorage…plenty of them! We stopped the car more than once and could have reached out to pat them. My favorite moose sighting: in 1975 in the St. John River as I canoed with a boyfriend. It was swimming right along next to us in the river. Did not think they ventured into fast moving water….? comparable fun with your birds. I just read your blog in the e-mail you sent about Moose in Mass. 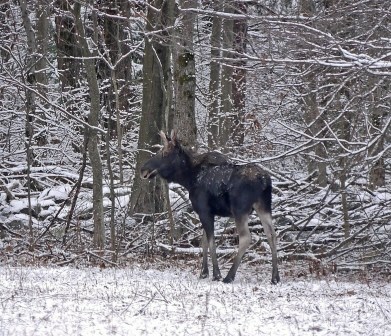 Where is a reliable location to view moose in Mass.? I have been searching for them in Central & Western Mass. with no luck. Do you know of a spot that is fairly dependable to see a moose? Please send location and simple directions. Thankyou!